Raising End Time Intercessory Prophets for the Coming of the lord Jesus Christ. 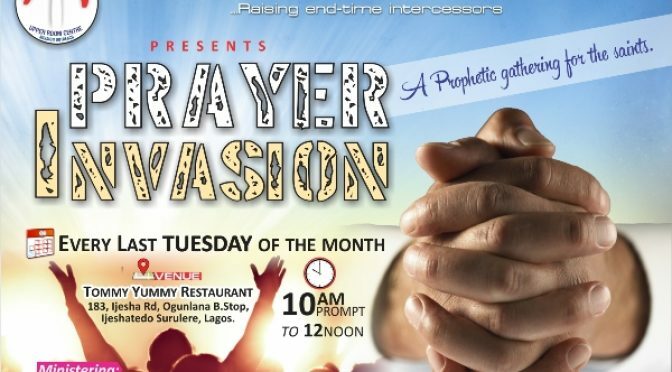 This is a special invitation for you to attend the Prophetic gathering tagged PRAYER INVASION (Every Last Tuesday of the month). You can listen to the Live Transmission of this prophetic gathering via 3 ways. Venue: Tommy Yummy Restaurant, 183, Ijesha Rd, Ogunlana B.Stop, Ijeshatedo Surulere, Lagos. Come and Experience the move of his Glory. Upper room centre mission outreach has been behind the scene for quite a while now but was fully lunched by divine instruction Nov 30 2013 to the glory of God. The vision of the ministry is to raise End Time Intercessory Prophets for the Coming of the lord Jesus Christ. 46, Apena Street, Off Ago Palace Way, Okota, Isolo, Lagos. © Copyright 2016 Upper Room Centre Mission Outreach. All Rights Reserved.